The Gunner's Mate (GM) rate has been part of the United States Navy since the late 1700's, dating back to when this branch of the service was founded. From cannons and muskets to sophisticated weapons systems such as missiles and torpedoes, the Gunner's Mate has played a critical role in the success of the Navy. As weapon technology has changed in over 200 years, the new systems created often required newly trained people and ratings (what the Navy calls its jobs) to be created as well. From GM Guns, GM Missiles, GM Mounts, GM Turrets, to Torpedoman and Nuclear Weaponsman, new rates were created. Now, they have all merged back to the original Gunner's Mate (GM) rating. Regardless of the changes to the rating system, the nickname for the Gunner's Mate has held for centuries, "Guns". Gunner's mates (GM) are responsible for the operation and maintenance of guided missile launching systems, gun mounts, and other ordnance equipment, as well as small arms and magazines. They work with electrical and electronic circuitry; mechanical, hydraulic and pneumatic systems. Besides operating the armories and ranges, the GM also handles the security, maintenance, and inventory of command owned small arms weapons such as the M500 shotgun, M60 machine gun, M14 rifle, M2 Browning machine gun, M4 and M16 rifles, M240 machine gun, M203 grenade launcher, M79 grenade launcher, M1911 pistol, Mk 19 grenade launcher, 5"/54 caliber Mark 45 gun, M242 Bushmaster chain gun, hand grenades, and other pyrotechnics. GMs are responsible for mounted weapons systems as well such as vertical launching system, Missiles, and torpedoes. GMs are also trained and responsible for maintaining handguns such as the standard 9mm Beretta that has been recently replaced by the Sig Sauer's P320 called the M17. The Gunner's Mates in the Navy Special Ops side will be handling the Sig Sauer, Glocks, and other weapon systems used by SEALs, SWCC, EOD sailors. To qualify for this role, candidates need a combined score of 204 on the arithmetic, mechanical knowledge, electrical and general science segments of the Armed Services Vocational Aptitude Battery (ASVAB) tests. They also need to be able to qualify for a secret security clearance from the Department of Defense. The screening process for this clearance involves a background check of character and finances, and a history of illegal drug use or alcohol abuse may be disqualifying. The Gunner's Mate A School (what the Navy calls its technical schools) is located in Great Lakes, Illinois. Training lasts 115 calendar days. 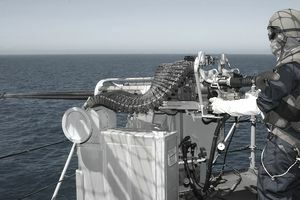 The training is both hands-on and computer based training and focuses on the operation, maintenance, and troubleshooting of all the Navy's guns and weapons systems. Depending upon their first command, general interests, and the needs of the Navy, newly trained GMs will go at an additional "C" school where they will get specific training for the job and platform they will be a part of for their first tour. You'll also need normal color perception, normal hearing and you must be a U.S. citizen to hold this Navy job.